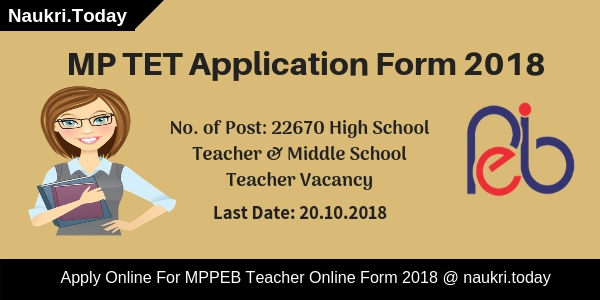 MP TET Application form 2018 – Hello Friends, There is a good news for you Madhya Pradesh Professional Examination Board has published notification for filling up Middle School Teacher Posts. The Department will issue MP TET 2018 Online Form for 5670 Vacancies. Interested applicants should check here education, age, and pay scale for Middle School Teacher Posts. Eligible Aspirants may fill up their application form for Madhya Pradesh TET 2018 from 28 September 2018. Online Registration will be closed on 12 October 2018. For more details, participants should read below article carefully. Madhya Pradesh Professional Examination Board is going to conduct Online examination for appointing candidates on 5670 Middle School Teacher Post. An Examination will be held on 19 January 2018. Participants can register online for MP TET Application Form form 28 September 2018 to 12 October 2018. Applicants who are eligible for Middle School Teacher Posts must check here further more details such as selection criteria or application fee. Latest Update as on 17.10.2018: Hello Friends, there is a good news for you. Madhya Pradesh TET Application Form registration dates are extended. Now The Department has released new dates for MP TET Online Form. Registration has been started from 06.10.2018 to 20.10.2018. Here we gave you direct links to apply for MP TET 2018. 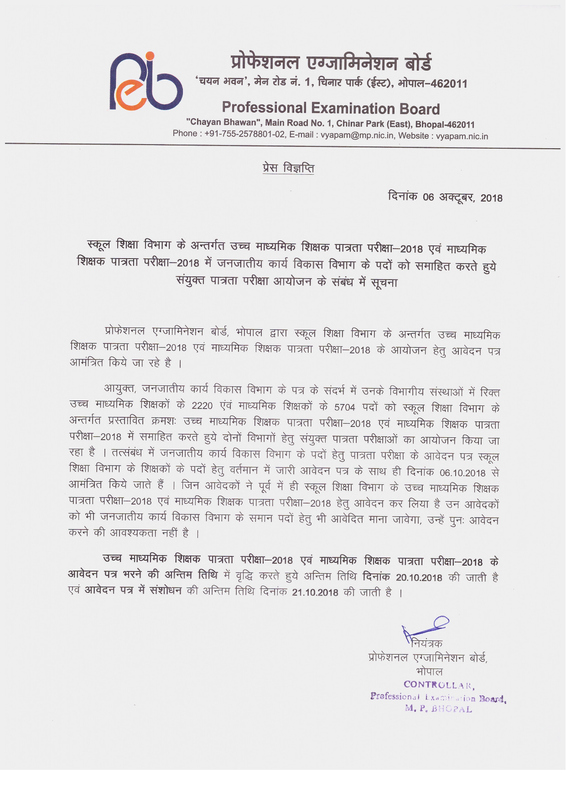 Check Here Official Notification of MP TET 2018 regarding registration dates. Participants should check here qualification, age, and application fee before applying for MP TET 2018 Online Form. Candidates must fill up their application form carefully. If any Mistake found in your online form, your form will be rejected. Candidates should check below section for more information regarding Madhya Pradesh TET 2018 Application Form. Participants must have a Bachelor Degree in relevant Discipline with minimum 2 years of Diploma of Primary education. Applicants may complete their Bachelor Degree with minimum 50 % are eligible for MP TET Application Form 2018. For further more details candidates should read Official MP TET Notification 2018 Carefully. The Department may set 21 years as a minimum age for Middle School Teacher Posts. Maximum age of Unreserved category Male applicants is 40 years and for Female /SC/ ST/ OBC Candidates is 45 years. the Department will set different age criteria for guest Teacher. Guest teachers are appointed for 200 days only. Check here table which contains age criteria for a Guest teacher as well as a regular teacher. Candidates need to pay some amount as an application fee MP TET 2018. Applicants should pay their application fee through online mode. Aspirants can use Credit Card, Debit Card, and Internet Banking for the payment of examination fee. The Department may set an amount of application fee for the different category. Check here table which contains Registration Fee Details. Selection of Candidates will take place on the basis of Online examination. Candidates who get qualify in Online Examination will get selected for Middle School Teacher Posts. An Online Examination will be held on 19 January 2018. Candidates must prepare hard to grad Middle School Teacher Posts. Participants should consult to official MP TET Notification 2018 for more information. The Department will pay Rs. 32,800 with Dearness allowance to the selected candidates. Participants should check read official MP TET 2018 Notification from links given here. Here we provided you easy and simple steps to download MP TET Application Form 2018. Participants should check here eligibility criteria, age, and application fee for MP TET Online Form 2018. Candidates who fit in eligibility criteria may apply online for Middle School Teacher Posts. Here we gave you easy and simple steps to download MP TET 2018 Application form. Candidates may search for Advt. section at Homepage. Now Click on MP TET Application Form 2018 PDF. Now read complete MP TET 2018 notification carefully. After that Eligible Candidates may fill up MP TET 2018 online Forms. Applicants should pay their application fee through online mode. Participants must keep one copy of application form for feature use. Conclusion: Madhya Pradesh Professional Examination Board has issued notification for 5670 Middle School Teacher Posts. Interested aspirants may check here eligibility criteria for MP TET Application form 2018. Here we gave you links to apply for MP TET 2018 Online Form. Are you looking for MP TET Application Form 2018? If Yes, Madhya Pradesh Professional Examination Board has announced Vacancies for the Post of High School Teacher. MP TET Online Application Form is available for 17000 Vacancies. 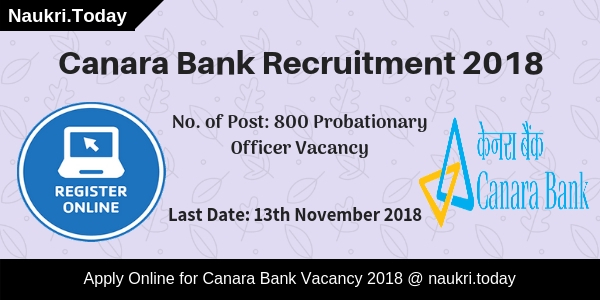 Before apply Candidates should check education qualification, age, & selection criteria for MPPEB TET 2018. Online Registration for High School Teacher Post has started form 11.September.2018. Candidates must fill up their application form before 25 September 2018. The Department is going to conduct written examination for MP TET 2018 Online Form on 29. December 2018. For further more details aspirants should read below article carefully. Candidates should check here eligibility criteria for MP TET Application Form 2018. Eligible Applicants must fill up their application form for MPPEB TET 2018 Online Forms. Candidates must fill up all the details carefully, otherwise, their form will be rejected. Participants may download MP TET 2018 Notification 2018 from links given here for more details. Candidates must complete their Post Graduation in relevant Discipline are eligible for MP TET Application Form 2018. Candidates must prepare hard to grab MP Vyapam TET 2018. For further more information applicants should read official MPPEB Notification 2018. The minimum age for participants is 21 years old. For maximum age is given below in Table. The Department will give age relaxation to applying candidates as per government rule. Applicants may also check official Notification of MP Vyapam Online Form 2018. Candidates should pay their application fee through Online mode for MP TET Application Form 2018. Aspirants should use a Credit Card, Debit Card, & Internet Banking For the payment of an examination fee. The Department may set a particular amount for an application fee of MP Vyapam TET 2018. Check Here Application Fee from the table given below. Selection of Candidates will be made on the basis of written examination. Participants who perform well in Written examination get directly selected for High School Teacher Post. For more details, aspirants should check MP TET Application Form 2018. Final Merit List of Selected Candidates will create on the basis of written exam marks. Candidates should check here eligibility criteria for MPPEB Vyapam TET 2018. Participants who found themselves eligible for High School Teacher Post must apply online from 11.09.2018. Applicants may fill up their application form before the last date. Follow these easy and simple steps to apply for MP TET 2018 online Form. Candidates may log on to official Website of MP Vyapam i.e peb.mp.gov.in. Now Aspirants may search for MP TET Application form Section at Homepage. After that Candidates should read the whole notification carefully. Now Eligible Participants may fill up their application forms. After fill up form aspirants should pay their application fee. Click on Submit Button to Submit It. Participants must keep one copy of the MP TET Online Form for feature use. Conclusion: Madhya Pradesh Professional Education Board has issued notification for 17000 High School Teacher Post. Candidates must fill up their application form for MP TET Application Form before last date 25.09.2018. For further more information participants should read the above article carefully. Department of School Education Madhya Pradesh ready to issue MP Teacher Eligibility Test, MP TET Application Form 2017. All interested and eligible candidates who want make a part of upcoming MP Teacher Eligibility Test can apply for this test. Online application form will be release may be in next month. Interested and eligible candidates can apply for MP TET 2016 before the last date of submission. Other details about MP TET 2016 please visit official website of Madhya Pradesh Vyapam. About Madhya Pradesh TET : MP TET Exam is now a kind of compulsory exam in Madhya Pradesh, if you want to become a teacher for class I to V (Lower Primary Teacher) Class VI to VIII (Upper Primary Teacher) Class IX to X (Secondary School Teacher). All those candidates who fulfill the given criteria and Indian nationals can apply for this exam. Candidates stay connected with us or add this page on your bookmark. For more information like MP TET exam date, MP TET eligibility criteria and MP TET 2016 syllabus. TET Exam For : Primary Teacher & Upper Primary Teacher Post. Posted in : Class 1st to 5th and Class 6th to 8th Class. Level of Exam : State Level. 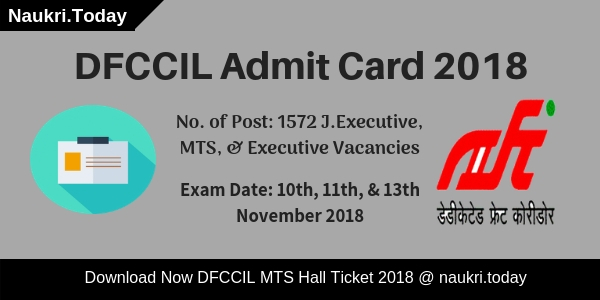 Eligibility and Qualifications for Madhya Pradesh TET : Candidates should have following qualifications as prescribed by the NCTE. The State governments may change the qualifications and eligibility requirements as per the GOs issued by them. Madhya Pradesh TET (MP TET) Qualification Teachers of Classes VI-VIII (Paper II) 2016 : Applicants having B.A. / B.Sc and those appearing in final 2 year D.Ed. / B.A. /B.Sc. with at least 45 percent marks and passed / appearing in B.Ed / Senior Secondary with at least 50 percent marks and passed or appearing in final 4-year Bachelor in Elementary Education (B.El.Ed) / 4-year BA/ B.Sc.Ed. or B.A. (Ed.)/B.Sc. (Ed.) / B.Ed. (Special Education) with 50 percent in BA or B.Sc are eligible for MP TET. Age Limit : Candidates Minimum age limit should be 18 years and maximum age limit should be 35 years old. Age relaxation as per government rule and regulation according to category wise. Selection Procedure : Candidates selection shall be made through OMR based Written Test & Personal Interview. Applicants who will clear written test, called for Personal Interview & Document Verification. II Paper Syllabus: To become teachers for classes between VI and VIII in Madhya Pradesh upper primary school. MP TET Admit Card 2017/ MP TET Result 2017 : Admit card will be available for Madhya Pradesh Teacher Eligibility Test 2016 before the 10 to 15 days of exam. Candidates you can download the MP TET 2016 Admit Card form official website of Madhya Pradesh Vyapam. Result of MP TET 216 will be update after successfully completion of MP TET 2016 Exam on official website of MP Vyapam. Candidates you can show your result by enter you required details. Now all those aspirants those who wanted to fill online form for MP TET 2016 then you can fill up online application form now online only by visiting official web Page and here below we have provided some of easy steps below on this page to apply online form for MPTET notification 2017. First open main web page of MP VYAPAM department. There you need to visit MP TET 2016 Section. Now read full MPTET Notification 2016 carefully. Click on link of MP TET 2016 application. Application will submitted and take a hard copy of filling application form for future procedure. MP TET Application Form 2017 : Madhya Pradesh TET notification has been released by Department of school education Madhya Pradesh or concern examination board. Interested candidates who want to be become Government teacher, they can apply for MP TET 2016 entrance exam before the last date.